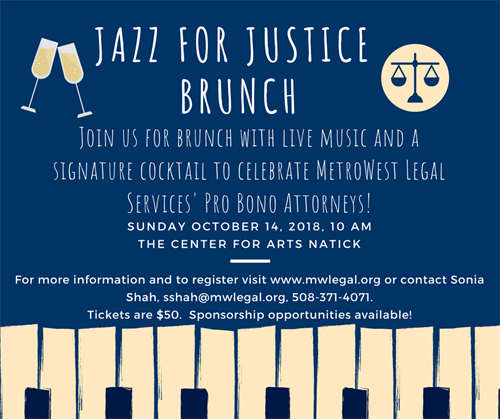 Join MetroWest Legal Services for our first ever Jazz for Justice Brunch! Enjoy brunch while listening to live music and celebrating the work of MetroWest Legal Services' Pro Bono Attorneys! The mission of MetroWest Legal Services is to provide legal advocacy to protect and advance the rights of the poor, elderly, disabled and other disenfranchised people in our service area and to assist them in obtaining legal, social and economic justice. We help our clients secure access to basic needs and challenge institutional barriers in order to achieve equal justice for all. All proceeds support MetroWest Legal Services.